Photograph, Exterior of the Cushing Memorial Library at Texas A&M University, named in Edward Cushing's honor. Courtesy of Texas A&M University Libraries. Image available on the Internet and included in accordance with Title 17 U.S.C. Section 107. CUSHING, EDWARD BENJAMIN (1863–1924). Edward Benjamin Cushing, president of the board of regents of Texas A&M, son of Matilda (Burke) and Edward Hopkins Cushing, was born in Houston on November 22, 1863. On February 18, 1888, he married Florence Abbey Powars. He entered A&M as a member of its second class in 1877. After his graduation in 1880, he worked for the Southern Pacific Railroad at Houston, first as an axman and rodman, then as assistant general manager, and then as maintenance-of-way engineer (1912). Early in 1917 he was commissioned a major and sent overseas as an officer of the Seventeenth Engineers, American Expeditionary Force. He served on the staff of Gen. John J. Pershing. For his services he was awarded the French Croix de Guerre. In 1919 Cushing became a federal bank examiner and at the time of his death was receiver for the First National Bank at Granger, Texas. He was appointed to the A&M board of directors (now regents) in 1912 and became president of the board in 1913. He also served as president of the Texas A&M Association of Former Students. Cushing was an Elk and a Mason. He died at Houston on February 17, 1924. 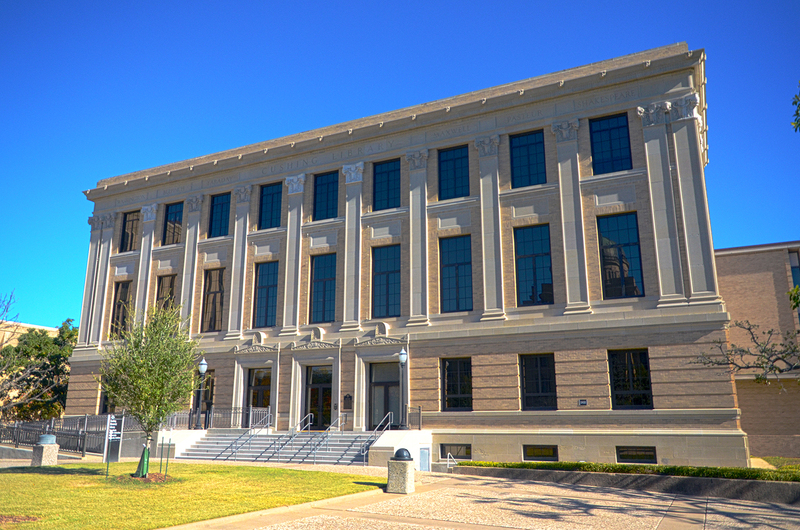 On November 23, 1927, the Texas A&M library was named the Cushing Memorial Library. National Cyclopaedia of American Biography, Vol. 21. Vertical Files, Dolph Briscoe Center for American History, University of Texas at Austin. Handbook of Texas Online, Hugo Ellis, "CUSHING, EDWARD BENJAMIN," accessed April 23, 2019, http://www.tshaonline.org/handbook/online/articles/fcu33.